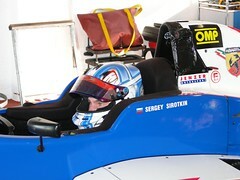 Until a few weeks ago, Sergey Sirotkin was virtually unknown to Formula One. Now he’s looking at the possibility of becoming the youngest race driver in the history of the sport. If all goes to plan, Sirotkin will make his debut for Sauber in 2014 at the tender age of 18. Sirotkin is the enormously fortunate beneficiary of a partnership that has been put together to bail out the struggling Sauber team. It’s no secret that Sauber have been battling to pay their bills during the 2013 season, with even the drivers having to wait for their salaries at times. There were rumours that Sauber was on the brink of disappearing from the F1 grid. With the heavy emphasis on aerodynamics and materials in Formula One, Sauber stands to benefit greatly from the partnership with, in particularly, the National Institute of Aviation Technologies, which will provide expertise and experience far beyond that of a typical Formula One team. The partnership comes at an exciting time in Russian motor racing. The inaugural Russian Grand Prix will take place at a purpose-built track in Sochi in 2014. It is with that in mind that the Russian government is pushing hard to increase Russia’s profile in Formula One, which includes the aggressive development of young Russian drivers. And that is where Sergey Sirotkin comes in. The plan is to have a Russian driver on the grid in 2014 to take part in the Russian Grand Prix in a Russian-backed car. Sirotkin may be relatively unknown, but he is by all accounts no slouch as a racing driver. He won the 2011 Formula Abarth Championship aged just 16, and has since won races in the Auto GP Series and Italian Formula Three European Series. In 2013, Sirotkin is competing in the Formula Renault 3.5 Series, which produced current Toro Rosso F1 driver Daniel Ricciardo. He has yet to win a race in 2013, but has recorded a second place and two fourth places already this season as he gets to grips with the series. If he drives in Formula One next season as planned, Sirotkin will shatter all of the “youngest ever” records in the sport. At present, the record for the youngest driver to drive at an F1 Grand Prix weekend is held by Sebastian Vettel, who was 19 years and 54 days old when he took part in practice for the 2006 Turkish Grand Prix. At 19 years 125 days old, Jaime Alguersuari became the youngest ever driver to start an F1 race when he took part in the 2009 Hungarian Grand Prix for Toro Rosso. Sirotkin will turn 18 on 27 August 2013, which will easily make him the youngest driver ever to race in Formula One if he competes for Sauber at any point in 2014. The problem is that he might well be too young. He is in just his fourth full season of single-seater racing and has never driven an F1 car. The learning curve for such a young and inexperienced driver in F1 is likely to be appallingly steep. The cars are much faster and more difficult to drive than anything he has raced so far, the races are longer and more demanding and the level of competition is unparalleled in world motorsport. To his credit, the young Russian is approaching his looming F1 debut realistically. He knows that he is young and inexperienced. He expects that Formula One will be an enormous challenge. But he also knows that, if he does not take the opportunity to race in F1 now, it may never come his way again. So who would he replace? Gutierrez brings money with him, so would Hulkenberg be on his way out?